The Western narrative of world history largely omits a whole civilization. Destiny Disrupted tells the history of the world from the Islamic point of view, and restores the centrality of the Muslim perspective, ignored for a thousand years. 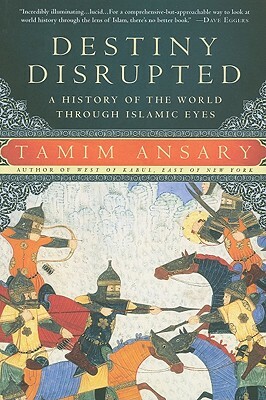 In Destiny Disrupted, Tamim Ansary tells the rich story of world history as it looks from a new perspective: with the evolution of the Muslim community at the center. His story moves from the lifetime of Mohammed through a succession of far-flung empires, to the tangle of modern conflicts that culminated in the events of 9/11. He introduces the key people, events, ideas, legends, religious disputes, and turning points of world history, imparting not only what happened but how it is understood from the Muslim perspective. He clarifies why two great civilizations-Western and Muslim-grew up oblivious to each other, what happened when they intersected, and how the Islamic world was affected by its slow recognition that Europe-a place it long perceived as primitive-had somehow hijacked destiny. With storytelling brio, humor, and evenhanded sympathy to all sides of the story, Ansary illuminates a fascinating parallel to the world narrative usually heard in the West. Destiny Disrupted offers a vital perspective on world conflicts many now find so puzzling.